RENEWED CALL: URGENT: Letter-Writing Action: Stop Sweden’s Illegal Deportation of Ahwazi Activist Ali Mansouri! UPDATE: Although Ali Mansouri’s deportation has now twice been halted by amazing acts of international solidarity, he remains at high risk of deportation; the Swedish government wants to defeat the movement for refugee rights. Don’t let them. Write & demand again that the Swedish government recognize Ali’s right to asylum. PLEASE URGENTLY SEND THIS SAMPLE LETTER TO STOP THE SWEDISH GOVERNMENT’S ILLEGAL DEPORTATION OF IRANIAN ACTIVIST ALI MANSOURI. The Swedish government demonstrates once again, despite its illegality, that it is determined to send an Iranian activist to detention, torture, and possible execution. We have pushed the Swedish government back many times now, and working together, we will do it again for dear Ali Mansouri. Please URGENTLY use this as a sample letter to send your own letter of complaint to the Swedish government; relevant email addresses are below. I am writing to you to demand an immediate halt to the imminent deportation of Ali Mansouri, an Iranian asylum-seeker who has sought refuge in Sweden from persecution by the Islamic Republic of Iran (case no. 10-829126). Ali was born on 2 February 1983 in Ahwaz. He is a member of a persecuted minority in Iran, and an activist of an organization called the Republic of the Arab Nation of Ahwaz. He was among those who rioted in the impoverished Arab shantytowns in April 2005 against the regime’s plans to manipulate the ethnic composition of Khuzistan to facilitate repression of Arab Iranians. Ali was arrested at the end of the summer of 2005 by the plainclothes agents of then-President Khatami’s Ministry of Intelligence. His computer and scanner, which he used to print and disseminate flyers and anti-Islamic regime literature, were discovered and confiscated. 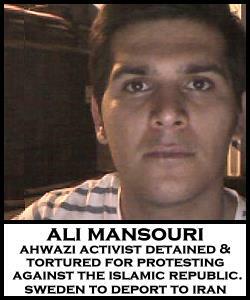 Ali was then detained and brutally beaten and tortured for 2½ months. He was released on bail pending a court process. Ali’s lawyer later explained to him that according to the indictment, he is accused of disrupting in the system, propagating against the public opinion, and acting against the national security. These charges frequently draw the death sentence in Iran. Rather than face further torture and probable execution at the hands of the Islamic Republic, Ali fled the country and 4 years ago sought asylum in Sweden to preserve his own life. As you well know, the Islamic Republic considers all Iranian political asylum-seekers to be criminals, deeming their quest for asylum as propagating against the regime. The Islamic Republic has on several occasions declared and applied its intent to prosecute returned political asylum-seekers, on the basis of Article 7 of the Islamic Republic’s Penal Code. Rahim Rostami, a teenaged Kurdish asylum-seeker returned to Iran by Norway and immediately imprisoned is one such example. Ali Mansouri has sought political asylum abroad and therefore, under the Islamic Republic, is subject to prosecution by the regime. It has also been documented during the recent attempted deportation of Peyman Najafi  that the Islamic Republic is keeping close surveillance on individual Iranian asylum-seekers abroad, publishing the names of Iranians seeking asylum abroad and anticipating their prosection under Article 7 once they are returned to Iran by complicit governments. Ali Mansouri is an opposition activist who, due to exercising his fundamental right to freedom of speech, is facing political charges should he be returned to Iran. He has already sustained torture at the hands of that regime, thus providing ample grounds for believing that the regime would implement torture against Mr. Mansouri again. This is in addition to the high probability of execution associated with the political charges that the Islamic Republic is pressing against Mr. Mansouri. It is illegal under international law for any country including Sweden to deport a person who has a legitimate fear of persecution in their home country. It is therefore undeniably illegal under international law for the Swedish government to participate in the crime of deporting Ali Mansouri to Iran, where he will be detained, tortured, and likely executed if he is returned to the blood-soaked hands of the Islamic Republic. Yet despite this finding, the Swedish government has continued without pause to illegally attempt to deport Iranian activists like Navid Mirpourzadih, Sanan Ashrafi, Marzieh Kamangar, Mehdi Maleki, Keivan Soufastaei, and others, all of whom are clearly and undeniably at risk not only of detention and torture by the Islamic Republic of Iran, but at unquestionable risk of execution. We once again demand an urgent, immediate halt to Sweden’s latest attempt to illegally refoule Mr. Ali Mansouri to Iran. He is certain to be tortured and is at clear and high risk of execution if returned to the Islamic Republic. Given the the Migration Office’s blatant, repeated violations of international law regarding refugee rights, risking the lives of Iranian and other asylum-seekers, we demand that Sweden must not only immediately halt the illegal deportation of Ali Mansouri, but must immediately cease all deportations to Iran.